Internet of things, or devices connected over a network, is no longer a fancy technology for the future. It’s here and fast changing the way we live. In the automotive sector, IoT has enabled greater transportation efficiency and management capabilities and is leading us to a future of intelligent, autonomous vehicles. According to Netscribes market research, the global automotive IoT market is expected to reach USD 106.32 billion by 2023, driven by the ever-increasing need for saving time and maximizing productivity in the fast-paced world. The introduction of high-speed mobile networks (5G and beyond) on the horizon will catalyze this growth through faster data transfers, response times, and enhanced vehicular communication. In-vehicle infotainment: Smart apps are being baked into car infotainment systems to provide in-car navigation, telematics, and entertainment. Google has partnered with several automakers to integrate its apps such as Google Maps, Play Store and Google Assistant into vehicle infotainment systems. Similarly, Apple CarPlay is offered as a feature in a number of mid- to high-end cars. Most vehicle infotainment systems today take the tethered or integrated form, which requires them to be connected to an external device for internet connectivity, such as a smartphone. 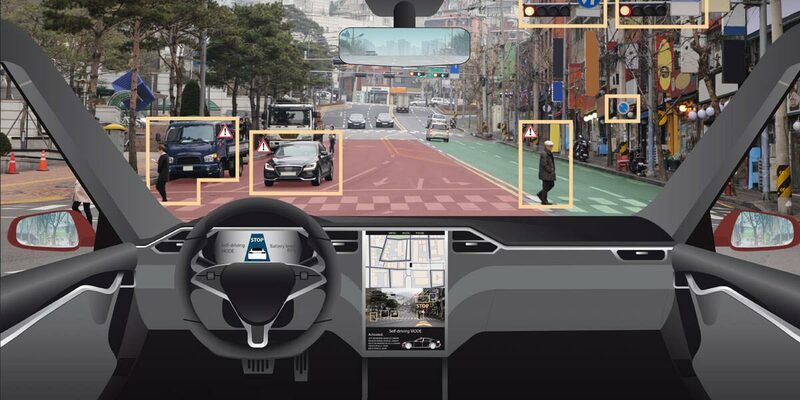 Vehicles of the future will have software and connectivity features embedded into their infotainment systems, allowing drivers to access maps, on-demand entertainment, and a whole lot of internet-connected services on the go. Predictive maintenance: Sensors in the operational components of vehicles monitor functional metrics such as temperature, engine status, speed, electrical systems and navigation, which measure performance variables and forecast performance benchmarks. The information gathered is used to update owners with preventative and predictive maintenance alerts helping them to address issues before they arise. Security, surveillance, and safety: External sensors are also used in the form of rear-view cameras and proximity sensors that aid in blind spot detection and assist in easier parking, and safer driving. Drivers are further protected, thanks to advanced sensors that can monitor surrounding traffic patterns and the environment to ensure safe driving. And with the use of mesh networked cars on the road, onboard systems can predict and avoid collisions far in advance of actual occurrences. Data analytics and dashboard reporting: Connected cars offer a rich source of driver data essential to the development, testing, and prototyping of better self-driving vehicles. As more and more vehicles with IoT enabled systems engage with the real world, the wealth and quality of data will inevitably improve. With data analytics and dashboard reporting tools, organizations in the auto industry can continue to improve their offerings and better serve the needs of their customers. Real-time monitoring: IoT also allows for real-time data sharing from vehicles to manufacturers that helps in the improvement of maintenance and manufacturing processes throughout the vehicle’s lifecycle. This sharing of data also helps enhance predictive insights to allow faster response times, in case of any serious problematic issues, and make it easier for manufacturers to be accountable and proactive in case of crisis scenarios. Cognitive insights for management: Connected cars allow manufacturers to directly and efficiently inform drivers about any problems and automate tedious tasks such as scheduling a car servicing appointment with the nearest car dealer or service center. This two-way exchange ensures that cars are regularly serviced in an autonomous fashion with little inconvenience to the user. As automotive IoT technologies continue to evolve, they are opening a host of market opportunities in the automotive domain. 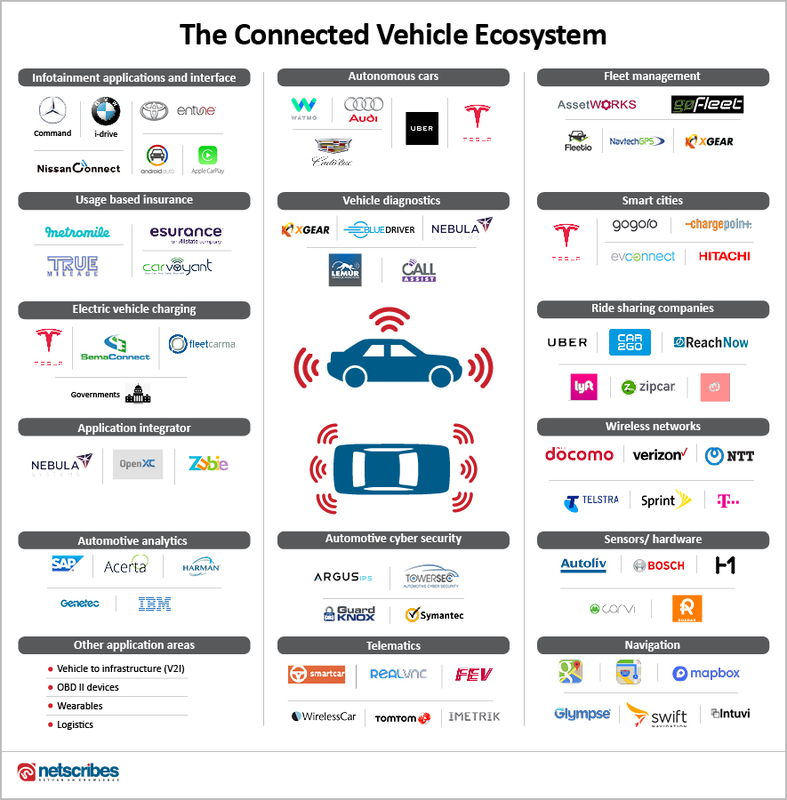 The connected vehicle ecosystem comprises a number of sub-segments that cater to different technology implementations. Various players such as automobile manufacturers, telecommunications providers, and software providers are participating in each of these segments to produce unique value within the connected car ecosystem. As newer innovations in IoT-enabled vehicles achieve economies of scale and customer acceptance, the nature of business is likely to keep changing. The inclusion and participation of analytics software vendors, applications service providers, and infrastructure stakeholders will play a greater role in the system and lead to a redistribution of roles in the industry. Automakers will be faced with a number of challenges in this transformation and need to take a number of steps to reinforce their core value propositions as the ecosystem of connected cars evolves. Netscribes delivers custom market and competitive intelligence services to help companies in the automotive industry stay nimble in the face of intense digital disruption. We provide an accurate picture of the current and forecasted market landscape based on in-depth technology and IP research and analysis. To know more, contact [email protected].